Cave rescue often has to overcome a number of challenges during the course of a rescue. Moving a casualty through a cave presents many obstacles, but one of the most difficult are the vertical shafts and climbs encountered underground. It may well be possible to manoeuvre a stretcher up a small climb using raw muscle power. But inevitably, it will be necessary to arrange a hauling system to raise the casualty, not least to ensure their comfort and safety in the lift. This requires ropes, pulleys and other devices to be put in place. To do this correctly requires great skill and experience – a badly rigged haul will usually be difficult and may well be dangerous. The first objective is to ensure the safety of all concerned – this includes the casualty and the rescue team. Sometimes the rigging of such hauling systems must take account of the number of people available – pulleys and special systems will implement a 2:1, or possibly a 3:1 ratio to reduce the load to be lifted. The setup must also allow for the pitch up which the casualty is to be raised. Often such a pitch may be roomy at the bottom, allowing the stretcher to lifted horizontally (the preferred position for most casualties) but as it nears the top will becomes narrow and twisting. Forcing the stretcher to be switched into a vertical orientation, this can then cause problems at the top of the pitch if there is limited head room – making it very tricky to remove the stretcher from the pitch into the safety of a level or passage. Many British caves begin as small, sometimes flat-out crawls and develop through gradually larger passages into the big passage that appears on many a Hollywood movie. Such passages are easy to negotiate for a fit, strong caver. But bringing an injured casualty back is fraught with problems. In the first instance, a rescue party will need to reach the site of the accident. They must transport equipment to the site – getting first aid, stretchers, exposure management, communications and other necessary equipment presents significant problems. The casualty may then need carrying back to the surface. In the larger passages, many cave rescue teams will use a rigid stretcher – this is easier to carry and offers greater protection to the casualty. But as the passages become difficult may not be possible to manoeuvre a rigid stretcher around the twists and turns. In this case we have two choices – either use a flexible stretcher or move the casualty out of the stretcher. A flexible stretcher, often known as a drag stretcher, offers less bulk and will allow some movement in the narrow passages meaning that the stretcher can be forced through. This is not always an elegant process and some brute force and ignorance may come into play. In the event that even the drag stretcher will not go through, then the casualty will be pulled through difficult or constricted passage outside the stretcher. To aid these cases, the casualty is often placed in a harness so that a pull can be given from in front, and as much protection as can be afforded is used. Inevitably there will be water in a British cave. The water can be flowing as a streamway or just standing water. A streamway presents many hazards – and particularly so if water conditions are high. The passage size of the streamway can range from a large, walking passage to a low wet crawl. A rescue team struggling to carry an injured caver carefully may have to contend with concealed ledges and boulders, and the force of the water pushing them over. In lower passages, rescuers will have to crawl through the water to move the stretcher along. They will lie in the water and drag the stretcher over their legs or bodies to keep the casualty out of the cold water as best possible. And the passage can twist and turn as described under the previous heading. Standing water presents different problems. But these are not usually as difficult as flowing water. It only becomes a serious problem when it forms deep pools. Just how these are handled will depend on the length and depth. The rescue team will attempt to avoid such obstacles in the first place. But if this is not possible, then a way of negotiating will be required. This may include using ropes assist the stretcher across, using inflatable boats or other floatation aids, or simply but crudely having members of the rescue team stand in the water and man-handle the stretcher across. From time to time, such areas of unstable areas of cave breakdown will move – an small earthquake can precipitate this. This may result in previously open routes becoming obstructed. Cavers may as a result be trapped on the far side unable to return to the surface – this was discussed above. When faced with loose rocks a rescue team will take extreme precautions. If we need to extract a party, then the first thought is to find a safe alternate route. This is often not possible. 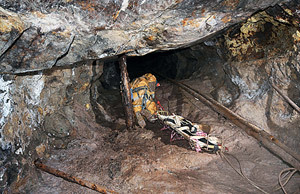 A team facing the need to dig their way through a collapsed boulder choke will used mining techniques, shoring upon excavated passage as it goes. Large boulders may need breaking, when ‘feathers’ or explosives may be used. Feathers are a means of forcing a number of chisel devices into drilled holes stressing the rock until it splits. But bringing an injured casualty back through such an area of a caver is fraught with hazards. It is the equivalent to manoeuvring through the narrow and constricted passage outlined above – only the passage may collapse on you! Rescue teams report this is a rare problem. Some of Britain’s caves contain over 50 kilometres of passages interwoven in a three-dimensional maze. 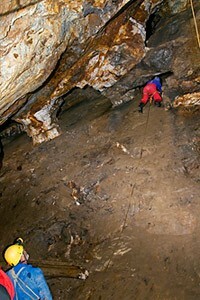 It is not uncommon for caving parties to be reported missing after trips into these caves. So how does a cave rescue team go about these incidents? Well, many such incidents are caused by parties under-estimating the difficulty of the trip and therefore under-estimating the time. These parties will be found on or very close to the surface. Otherwise, the rescue team will carry out searches of what are called the trade routes through a cave- the routes most often used by visiting parties. It is usual for such parties to indicate where they are going in the cave helping the team narrow the search area in the first instance. And many are found on or close to such routes having been unable to find the way on. Once the trade routes have been checked, then we have a much more serious problem on our hands. A search of all the relevant trade routes will have taken many hours and will have exhausted a portion of the rescue team. A search plan will be evolved based on the known plans of the party, the knowledge of the cave by the team, likely scenarios that may have caused a change of plan, and any other influencing the problem. Further cave rescue members and members of other nearby teams may be called in. It is also possible that cavers who have specialised knowledge of that particular cave will be called in to assist. Searching will then continue until the missing party is found. Such searches have been known to take many days!